Caddyshack’s menu boasts a wide variety of family-friendly foods. The golf theme is enhanced with menu items such as the Classic Caddy Cheeseburger, Spaulding’s Hack Salad, and drinks such as the Caddy-Rita and Pool Water Martini. However, if you want to start things off right, you have to try the Crispy Potato Golf Balls. They follow in the southern tradition of a fried potato pancake (only shaped like a golf ball) made out of Sunday dinner mashed potato leftovers complete with cheddar cheese, bacon and a horseradish dipping sauce with just the right amount of zing. One word…sublime! The Chicken and Waffles is one of the favorites on the menu. It is their nod to a culinary tradition that has its roots in soul food and Pennsylvania Dutch cuisine. 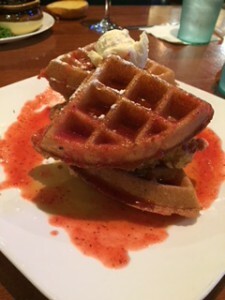 The menu portrays it as “lightly fried chicken breast tenders layered between malted waffles, drizzled with spiced maple syrup, strawberry purée, a dollop of whipped butter, and dusted with powdered sugar.” Just reading it will make you gain ten pounds! The spiced maple syrup almost tastes like it is made with sriracha sauce…sweet with a kick of spice. Whatever menu item you decide to try, you definitely have to visit the Murray Brothers World Golf Village Caddyshack (their second location is slated to open in Chicago the end of 2018). Start out at the bar and visit Rocco, who also happens to be a REALTOR® for Davidson Realty,Inc. here in the World Golf Village. If you visit Caddyshack on a Wednesday, you can play some trivia and on Thursdays, you can enjoy live music. Caddyshack is World Golf Village’s hole-in one!